The first distilled rum dates back to the 1600’s when outlaw pirates sailed the Caribbean in search of gold and treasure. Today, 400 years later, the best American rum is made right here in Louisiana at the Old New Orleans Rum Distillery. We finish it by adding warm molasses to every batch right before bottling to create a unique sugarcane flavor unlike you have ever tasted. 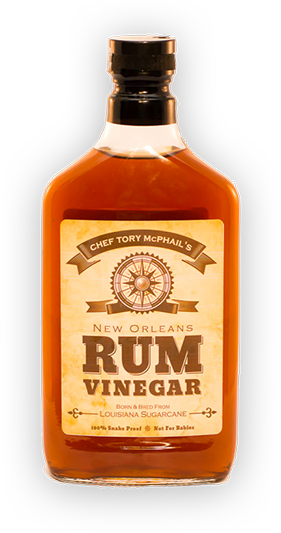 Similar in body to the finest aged Italian balsamic, try this vinegar “neat” and appreciate an original, Chef Tory’s Rum Vinegar.